NFL quarterback Colin Kaepernick took a knee during the national anthem this weekend to protest Donald Trump, and inadvertently found himself engaged to cheerleader Brandine Summer Kentucky. The protests against wannabe Bond villain, Trump, were widespread throughout the NFL during this weekend’s games, but quarterback Kaepernick got more than he bargained for when his kneeling was misinterpreted by a San Francisco 49ers cheerleader as a proposal of marriage. 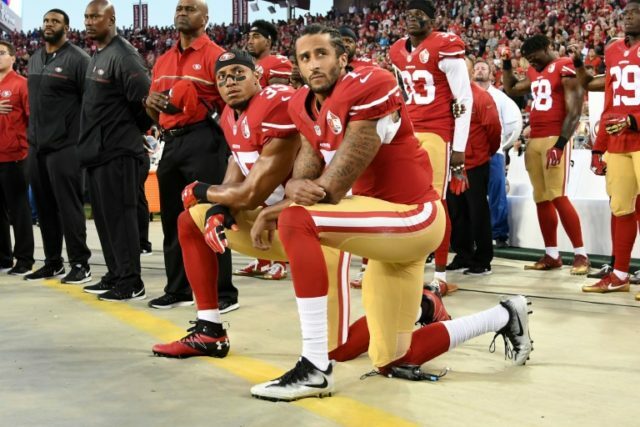 Rather than cause a scene, and potentially disrupt his otherwise solemn protest, Kaepernick stayed silent and allowed Brandine to believe the proposal was genuine. Brandine gleefully cheered, clapped and generally made a sugary mess of the whole situation while Kaepernick tried to remain focussed on the serious issues at hand: protesting the toupee’d terror. Kaepernick is said to be distraught at the whole situation, but is unable to break the news to Brandine as she hasn’t, to date, paused to draw breath. The Bugle asked President Trump for comment on the engagement of Kaepernick and Kentucky, and he reportedly labelled it ‘FAKE NEWS’.